MARKET ENVIRONMENT: by Woody Dorsey. Stocks continue to be difficult to diagnose. The interim trend remains nominally positive, as expected. Some corrective behavior was due and may have occurred quite quickly. But this is a tricky month and the most professional traders are not willing to trade very much in these technical circumstances. Don’t be seduced into any firm opinions. Near Term Diagnosis: Sentiment is 90% Bullish today. Interim Term Diagnosis: The Interim Trend remains positive into the next ideal Sell zone in Dates are for members only There is a Kill Zone coming due then. Long Term Diagnosis: Equities have likely registered an important Cycle High. The next major Low is due in 2022. MARKET TIMING: The rejections from the 2800ish level have continued… The Interim Trend is still positive. A nominal tactical top remains due near Dates are for members only . Repeat: “There is notable turning point volatility near Dates are for members only and Dates are for members only: All of that infers tricky trade. Expect investors and traders to be fooled both ways.” That may have just happened once again! There is also a Dates are for members only High due in the S&P but the QQQ High comes earlier. Indeed, we are seeing that QQQ strength is the leader. Again in Dates are for members only , it looks like a “Kill Zone” may set up and the multi month interim decline that many thought would occur now may begin then. 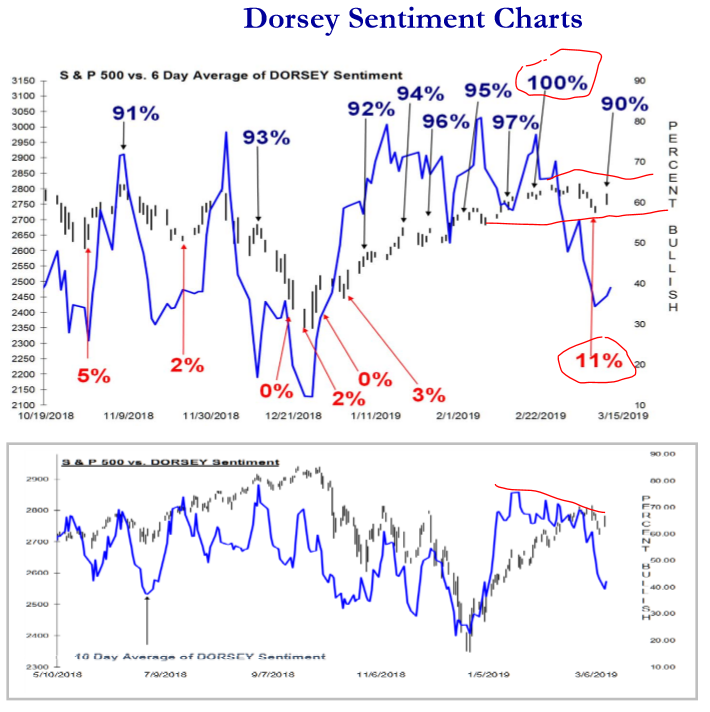 SENTIMENT INTERPRETATION: The Dorsey Tactical Market Sentiment had been showing optimism for some time. 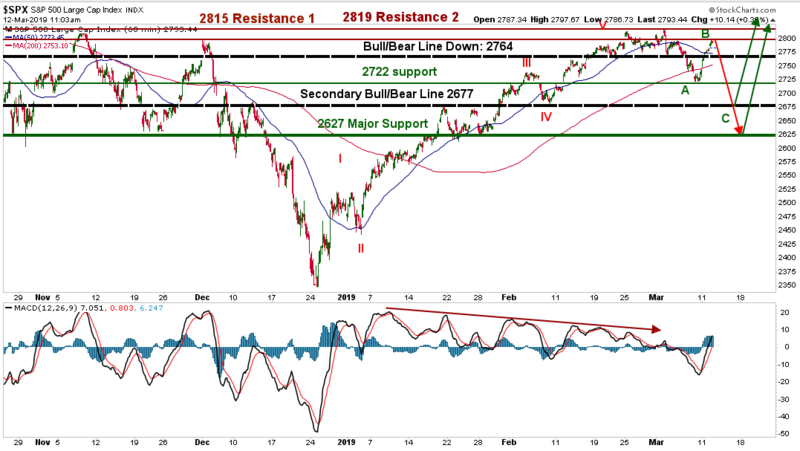 The 100% bullish reading on 2/18 tagged the 2776 level as an extreme. Again: “Stocks have not moved that far from there.” That 100% Bullish signaled that the most obvious bullish concepts had occurred to everyone! Now, the 11% Bullish on 3/8 was clearly a ruse of risk appetite. Stocks have reversed very strongly from there. It is a tell that the interim trend really is still positive. The DORSEY Interim Market Sentiment notably diverged before having a bit on a mini plunge last week. It is starting to recover but may just remain rangy. MARKET SUMMARY: Stocks are still “Messy.” Professional traders do not rust them with good reason. I don’t either. As noted: “The month of March could fool traders, both ways. This is still a low probability trading market.” Don’t get any high hopes here but don’t be looking for a crash either. Trading Instrument (Gary Uses) My Trading Instruments are all based off of SPX numbers, but for long side trades I use (SSO) the 2x leveraged etf that follows the S&P 500 and when expecting the market to move lower, I use (SDS) the 2x leveraged etf that follows the S&P 500, it moves higher when spx moves lower. 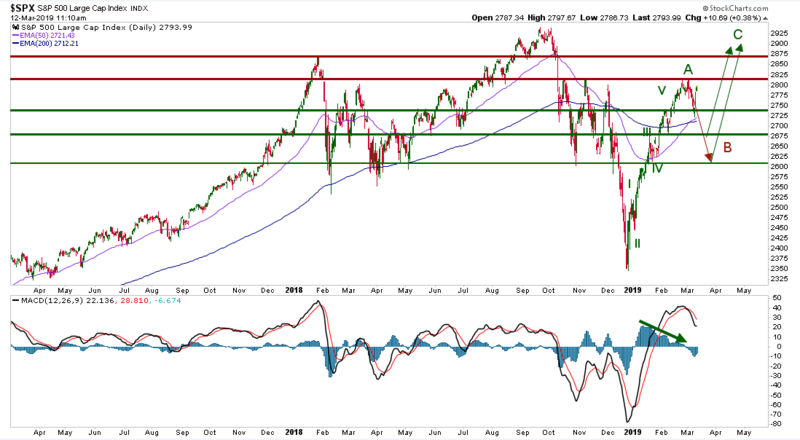 TECHNICAL VIEW by Gary Dean: The recent decline from 2817 to 2722 was the largest pullback we have seen in 2019. Buyer stepped in with both hands and we have seen a non-stop buying spree off of those lows. But is it really the lows? My preferred pattern says no and here is why. The daily charts are showing bearish divergences and have just started rolling over. The pattern in place on the spx futures is showing 5 waves up with bearish divergences in place as well. The rally off the lows was stopped (for now) right at the 78% fib line (2797) which is typical of wave 2’s up. That is leaving the door open for a sharp drop from these levels if the ABC pattern is going to play out. I think it is important for the bears to defend the 2797 resistance if they want a chance to take the tape lower. If they lose it, we could see a another double top pattern. From a technical point, more downside would be healthier for the bulls to continue higher and I still am looking for 2709-ish as a downside target. The 15 minute resistance is now support. The bears need to push the spx below 2780 to start any downside momentum, but really have to get it through 2770/2764 to get any traction. There are bearish divergences in place and the 78% fib resistance line did hold for now. Watch the 2764 again, that is where I believe we could see another round of panic selling if broken. Still-No changes on the daily chart: I am looking at this move higher as a wave 5 of A and once it completes, we should get a sharp wave B down. But once that completes, a wave C up should take us above whatever highs we leave behind. There are some bearish divergences on this momentum indicator, but the true indicator is not showing these divergences. I am not married to this pattern, but will stick with it until proven wrong. 2704 should be a magnet to the downside. Summary: The has had a massive rally off the lows and there are some bearish divergences in place. My preferred pattern is we just completed or completing wave B up and wave C down is going to follow which would take the spx to the 2709-ish or lower once completed. But the bears need to defend the 2797 line or we may see the bulls try for the 2817 area.